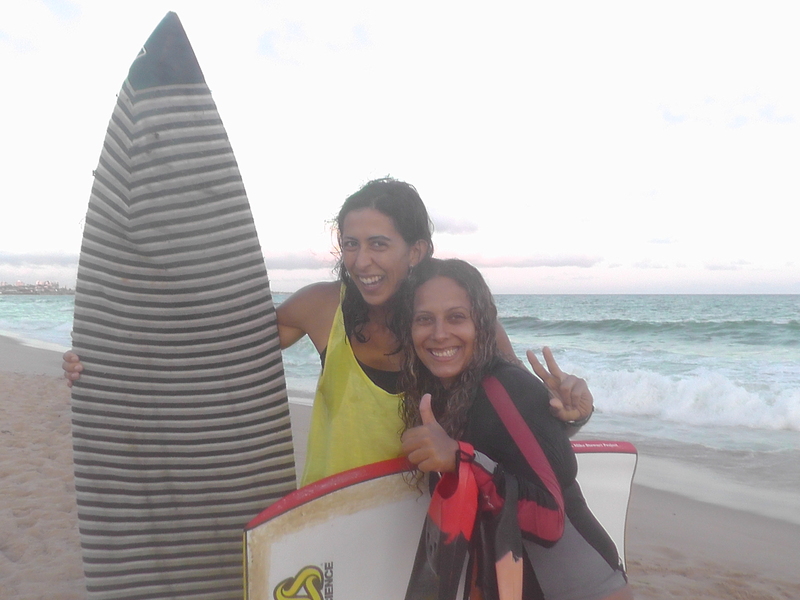 January | 2013 | Surfer Grrrls Brazil! 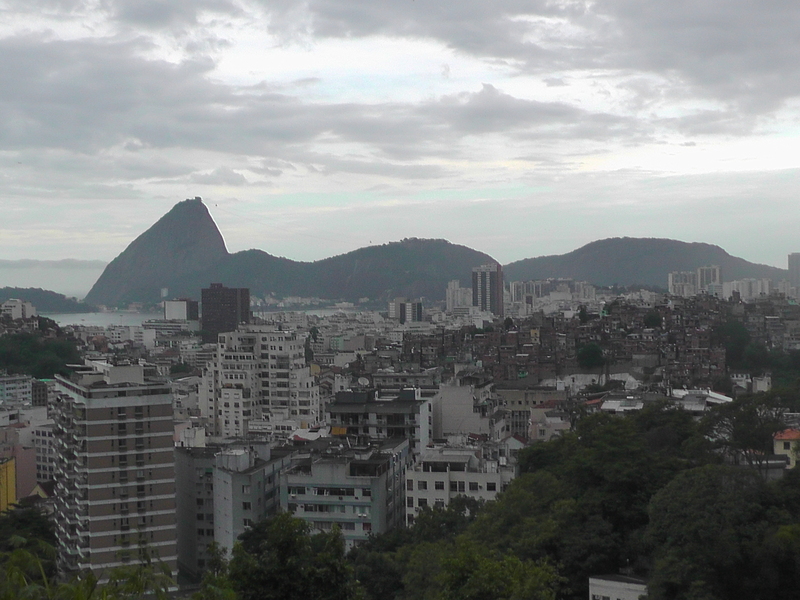 Rio De Janeiro, Oh but you are so beautiful! 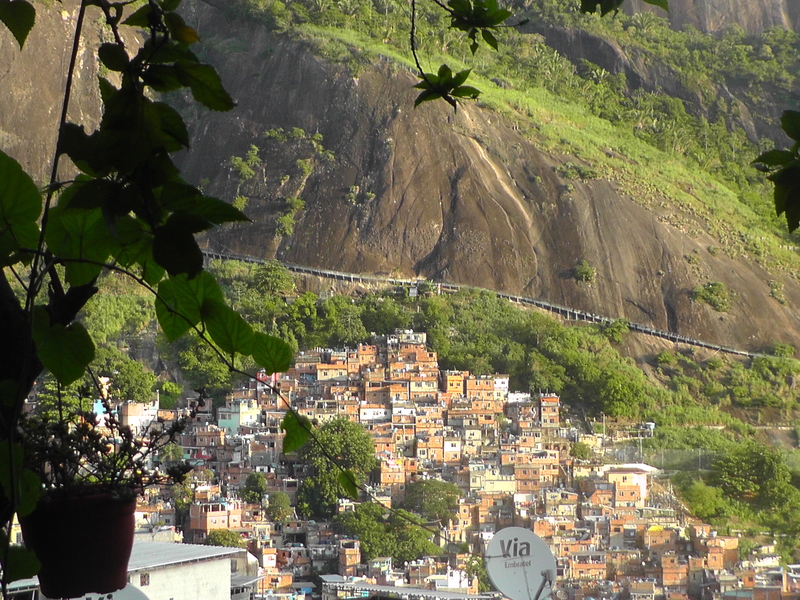 Rio DeJaneiro is a shockingly gorgeous city. It sprawls across huge rainforest covered mountains, punctuated by towering rock edifices on the edge of crystal blue beaches. The people are as beautiful as all the songs and stories say. And the vibe is festive, relaxed, friendly, fun-loving, musical. bear, chatting, and listening to music. The view from my friend Andrew’s apartment looked out at a tree-covered valley and a hill on the otherside with the ocean off in the distance. Every night, before I went to sleep, I would look out at the twinkling lights spread across the hillside, and feel like I was part of something bigger. partying – everyone from babies to grannies loves to get down here – and this street party embodied it. Here’s a video, that, while a bit sloppy (I was dancing while I shot it), gives you a feel. 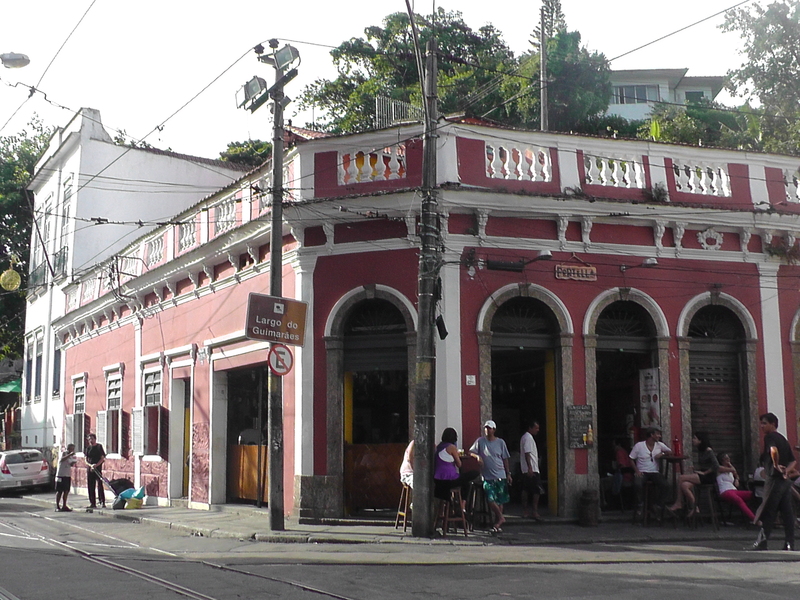 A day in the old city to say goodbye to Salvador! 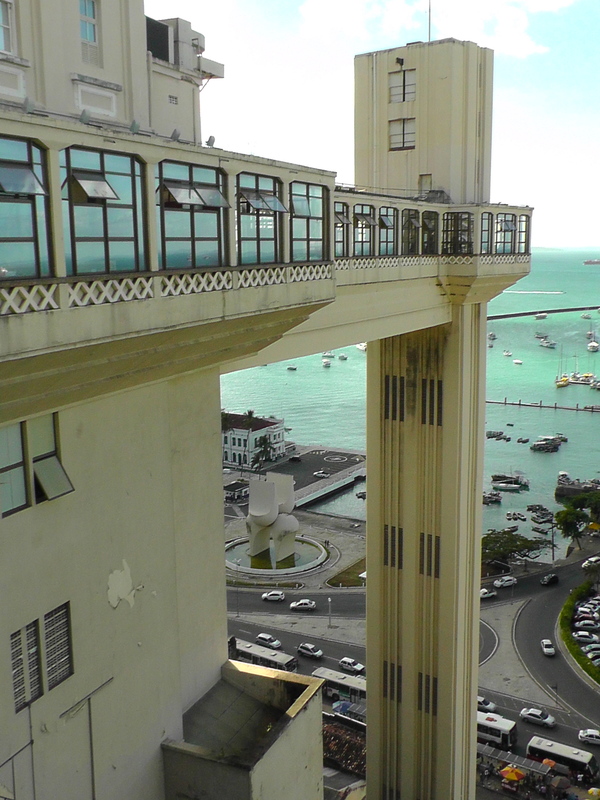 At the famous Lacerda lift, which connects the “Cidade Alta,” or high city, with the “cidade baixa” or low city by the docks. 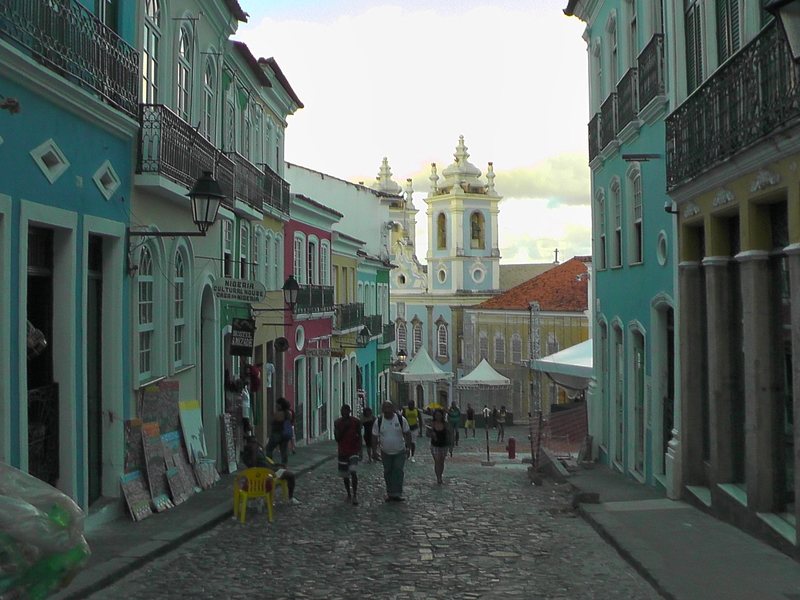 One of my last days in Salvador I went to the older part of town, the incredibly beautiful and historic Pelhourinho, and spent magic hour walking down cobble stone streets amidst pastel painted beautifully restored colonial houses. I wandered in and out of art galleries and enjoyed the stunning views from the high city down to the water front. teenagers and children, nearly all of them girls. I felt like I had discovered my greatest dream spread out before me – girls, uninhibited, confident, proud, fierce, strong, dancing down the sidewalk joyously, creating a big powerful contagiously grooving sound. Nearly everyone walking down the street stopped to watch in admiration or dance. many of them dancing. . The girls were smiling at each other and showing off on the dance steps, with the younger girls working hard to keep up with the more experienced older ones. In the front, the bright qeyes of the little ones were glued on their conductor, also a woman, who was playing them the cues for their parts. My favorite part was when the conductor called upon members of the band one by one to play their solos. She would point with her drum stick to a band member, then when the break in the music came – they would play their own little riff. One particularly energetic little girl kept jumping up and down, “me, me, me” she kept saying to the conductor, till finally it was her turn, and she executed her part perfectly. 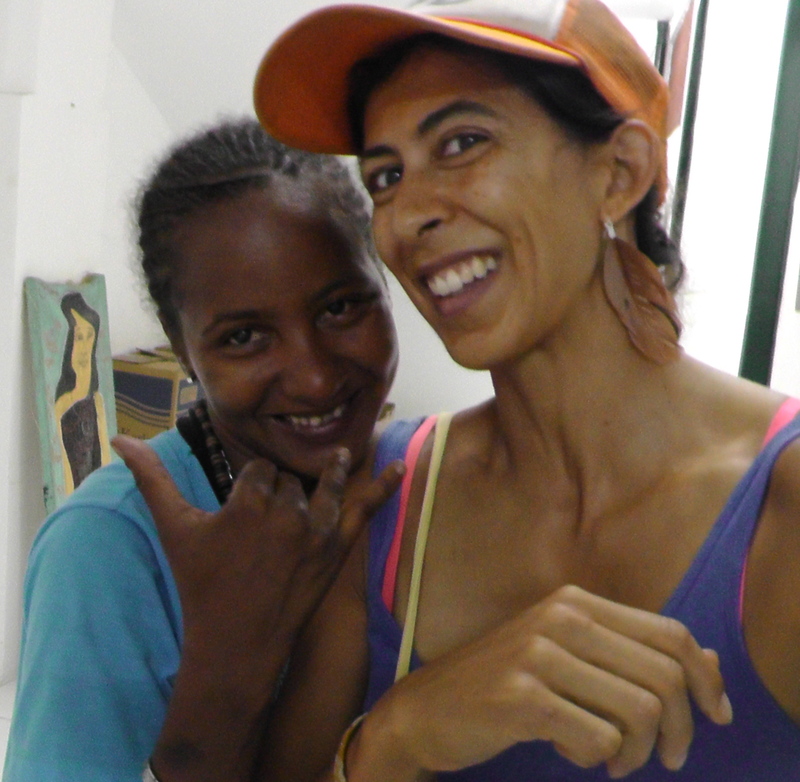 Upon realizing her success she broke into a thrilled smile that could have lit up the whole state of Bahia. The little ones went one by one, literally trembling with glee once they completed their parts. 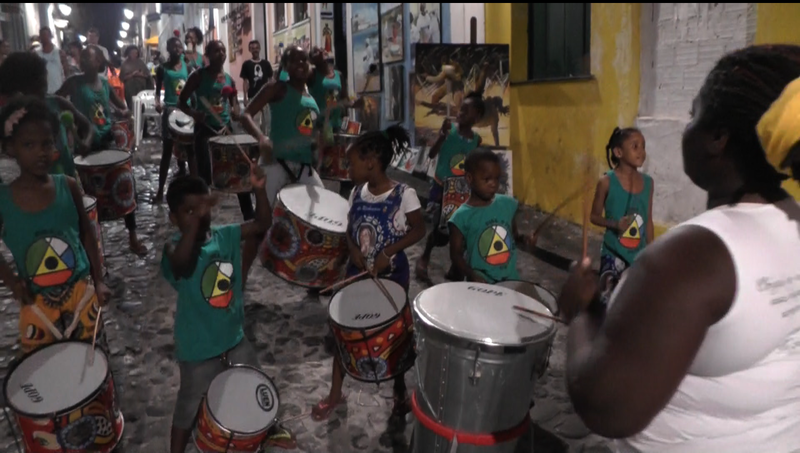 male-dominated world, I was just so happy that other little girls in Salvador could grow up seeing this awesome girls batucada and know, without questioning or doubting or having to prove anyone wrong, that they could make their own powerful music and get a street full of people dancing. 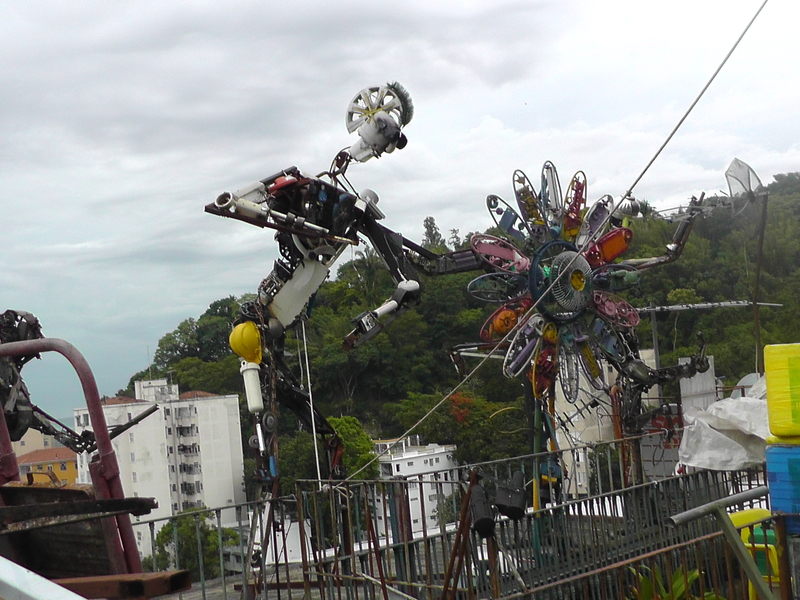 Also during my day in the Pelourinho, I stumbled across a really cool drop in center, working with folks who are living on the street in this part of Salvador. I met a young woman named Sheila who gave me a tour, during which I learned that she was a rapper too! Before I left, she shared some rhymes with me and we took this shot. 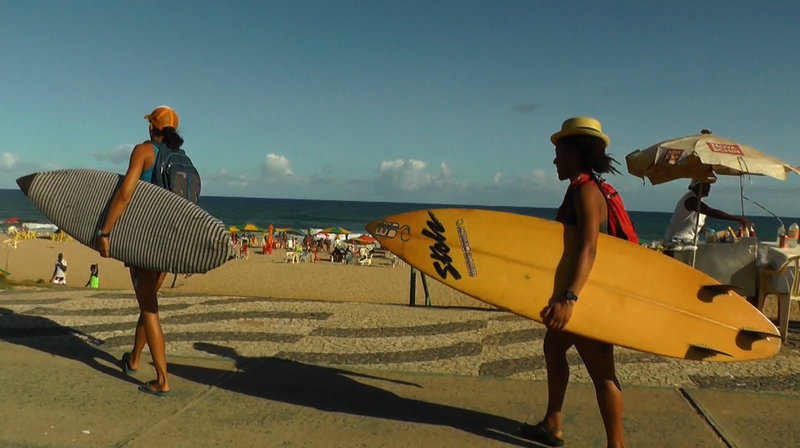 My first day surfing in Salvador, I made a friend Tharcisio, who was also a rapper. He introduced me to his crew (which includes many amazing pop and lockers), and we all met up at the end of my busy day in Pelhourinho to attend a show. 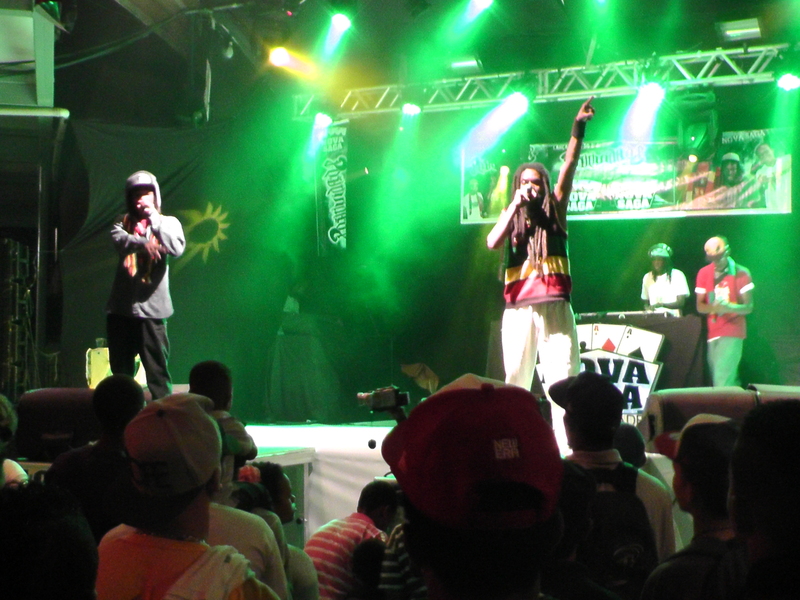 Father and son hip hop duo! 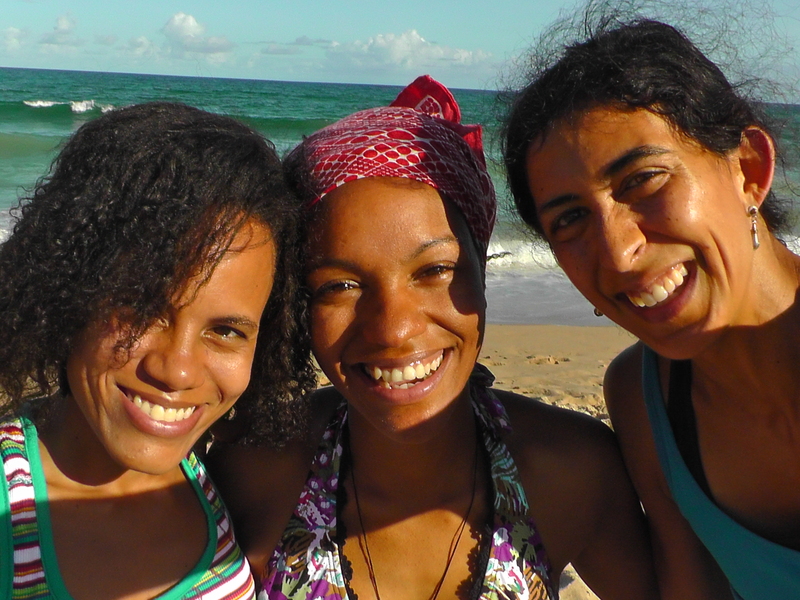 Bahia is the part of Brazil where Afro-Brazilian culture is strongest. 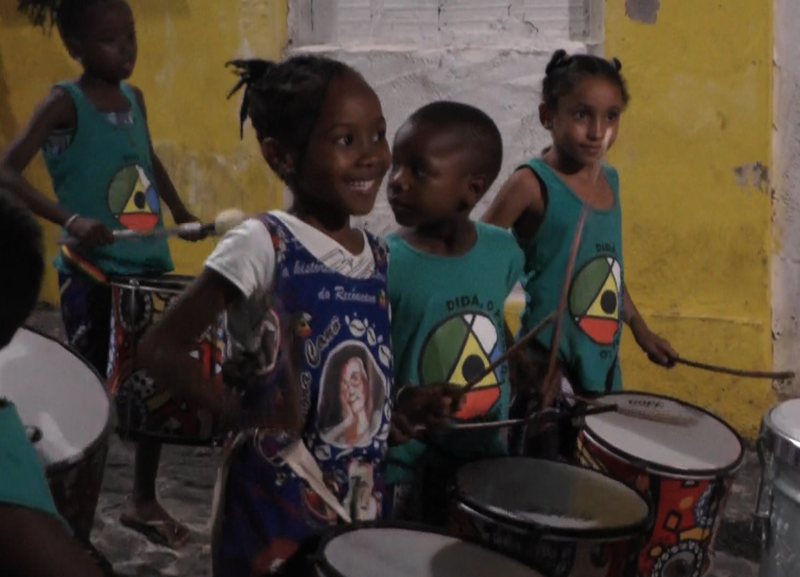 The Afro-Brazilian religion Candomblé arose here and is still vibrant in everyday life. Candumblé is based on the worship of Orixás, or deities, mostly of the Yoruba tradition. 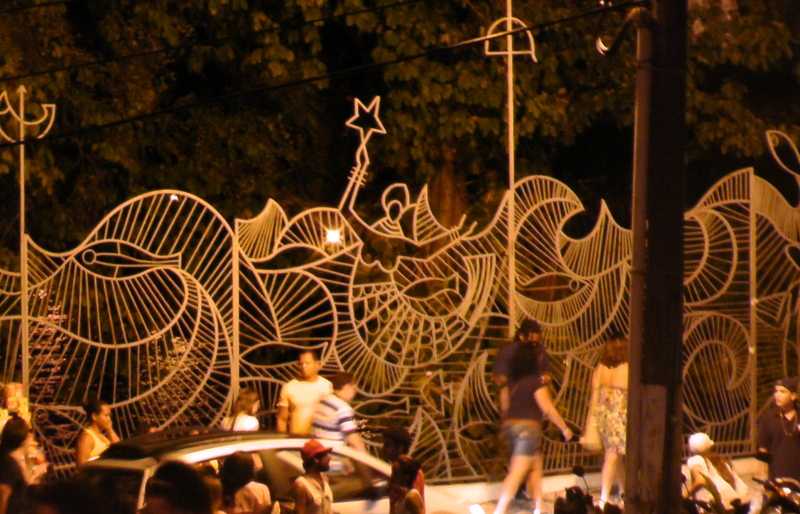 While living in Salvador, I often heard references to Iamanjá, the orixá of the sea, and it was nice to think of her every time I went surfing. 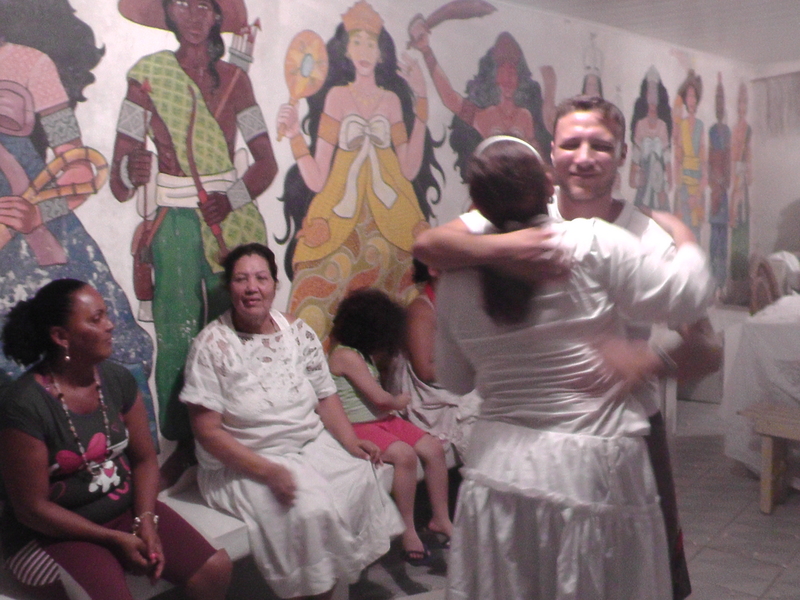 I had a very special opportunity to go to a Candomblé ceremony with friends from our neighborhood in Candeal. During the ceremony, led by a Mãe de Santo, everyone sang songs for the different orixás and the Mãe de Santo became possessed with the spirits of each one. I couldn’t take pictures during the ceremony, but afterwards I was able to snap some shots of the beautiful room in which the ceremony was held, with the orixás painted on the walls. At the Museu Afro-Brasileiro in Salvador, I was able to see a magnificent set of wood panels of all the orixás carved by the artist Carybé, who spent most of his life in Bahia. Farol da Barra beach – Tiny waves, awesome people, beautiful lighthouse at the very end. In every new place I go, I have to figure out how to get to the beach. My first day surfing in Salvador I hauled my board unto the very bouncy and rackety bus to end up at Farol da Barra, a gorgeous beach at the tip of the city, with a historic lighthouse at one end. 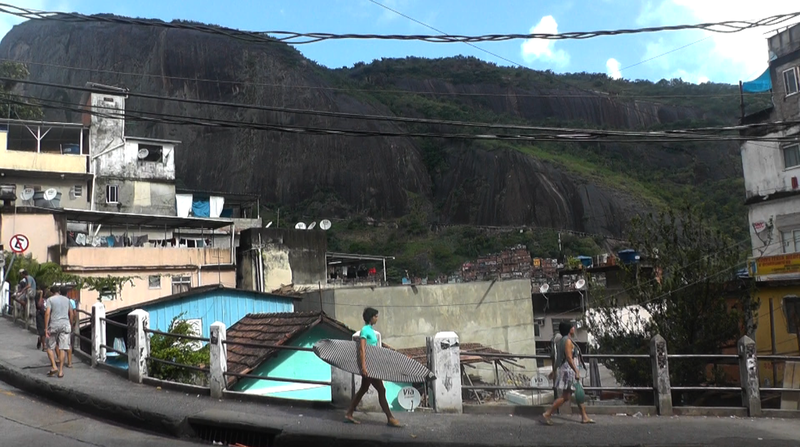 This was an urban beach, very different than the beaches of Floripa, which are often surrounded by mountains and sand dunes. I also realized how spoilt I’d gotten in Floripa. 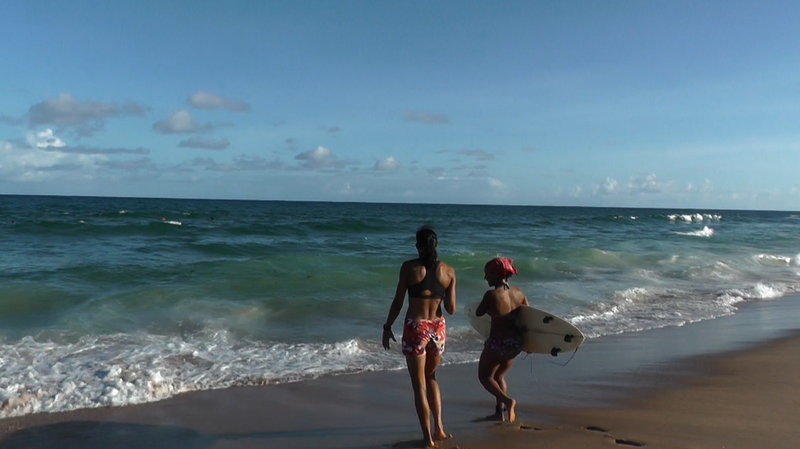 The beaches of Salvador, while beautiful, do not boast the best or biggest waves on your average day. But I am learning about Brazilian beach culture, which is how the rest of non-surfing Brazilians enjoy their coastline — lounging by their umbrellas, eating fried fish and any of the assorted delicacies brought over by the passing vendors, and drinking fresh coconut water while working on their tans. I’ve been trying it out and its not bad at all. 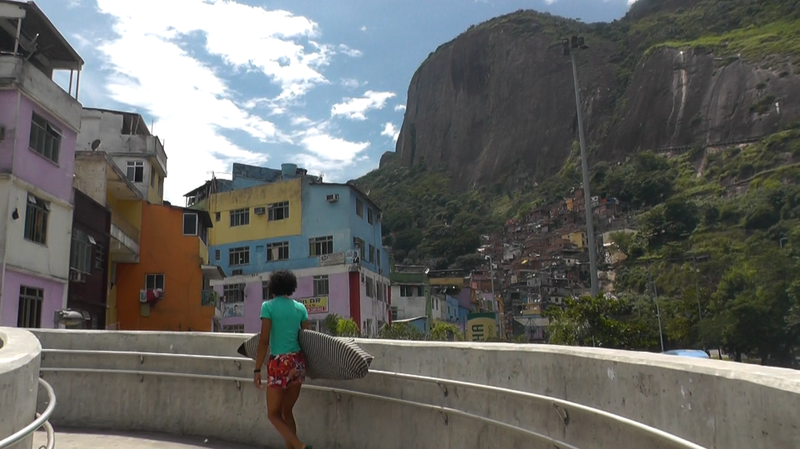 Later I found what would be my favorite surfing beach, Jardim da Alah. I met an awesome vendor of coconut water named Fabinho, who works on the sidewalk by the beach and kindly watched my stuff (a major issue when on a solo surf adventure). After my session, I learned that he was a friend of many local surfers who all left their stuff with him and hung out afterwards drinking coconut water. He taught me how to use a PVC pipe to pump out water, guerilla style, from a municipal source on the edge of the beach, so I could get a freshwater shower before I got back on the bus. Thanks Fabinho!